Type: Vatted Malt. 100% malt whisky made by blending single malts from different distilleries. Tasting Notes: Smoky, rich, complex. Amazingly soft on the palate for its strength. Lead Distilleries: Clynelish, Glenlossie, Caol Ila. Casks: All from American oak; a mix of recharred and refill types. Bottling Details: 46%, not chill filtered, natural colour. 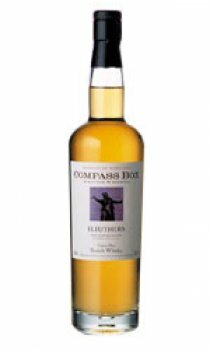 Jim Glaser's Tasting Notes: "I designed Eleuthera to be the most drinkable smoky malt whisky possible. I love smoky malt whiskies, but I find most of them too dry or simply too one-dimensionally smoky to drink more than one glass at a time. The key to Eleuthera is to set just the right amount of smoky Islay malt whisky against a backdrop of rich, sweet Highland whiskies. This gives you a very smoky, yet beguilingly sweet and drinkable, dram.